After entering the show grounds, the first competitions that you will see are the fruit, vegetables and flowers. Traditionally that has been one of the strongest sections in the show. Despite the very hot and dry summer, initials indications are that entries will be up to the usual high standard. The winning entries will be perfectly shaped and blemish free. Growing carrots and parsnips up to 600mm long is surely an art in itself. There are eight classes for fruit, 12 for flowers and 28 for vegetables. The novelty vegetable section sponsored by Piltown Fuels is always amazing. Who can grow the biggest marrow, pumpkin, potato, onion or sunflower seed head? 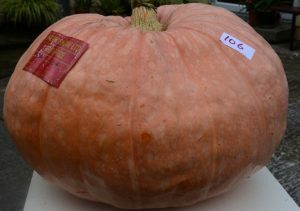 Last year the winning pumpkin weighed in at around 60 kilograms. Can a new record be set this year I wonder? Have a look around your garden or your friends or neighbours and I’m sure you will find some flowers to enter. Can you find a rose or a dahlia? You will easily find some coloured or tinted foliage around the garden or hedgerows. Be creative. The flower arranging classes are a wonderful interpretation of the themes. This year’s themes include ‘Glory of the Garden’, ‘Just a Few’, ‘And Always There is the Sea’, ‘Harvest Time’ and ‘Small is Beautiful’. For young people there is the ‘Fairy Garden’ and ‘All Creatures Great and Small’. And their creations are just wonderful. Here are some tips to help you improve your flower arranging. We look forward to seeing you exhibit in the classes at Iverk Show on August 25th.